Riding dynamics coupled with versatile touring capability – the new R 1200 RS takes sports touring to a thrilling new level. BMW Motorrad’s legendary RS production bikes have long symbolized travel and sport in equal measure. In 1976, the R 100 RS became the first mass-produced motorcycle in the world to come with a full, frame-mounted fairing developed in a wind tunnel. As the consummate all-around touring and sport riding bike, it helped establish the industry’s sports tourer segment. With the arrival of the new R 1200 RS, BMW Motorrad is continuing this long tradition by unveiling a sports tourer powered by a flat-twin engine that succeeds in transposing the all-around qualities of the original BMW RS concept into modern day appeal with stunning results. Whether darting along country roads, revelling in its dynamic performance with a passenger on board, or embarking on a long tour – the new R 1200 RS takes sports touring to a new level. Meaty, mightier boxer engine for dynamic sports touring. The flat-twin boxer engine on the new R 1200 RS is the same DOHC drive unit that already powers the R 1200 GS, R 1200 GS Adventure, R 1200 RT and the new R 1200 R. It produces 125 horsepower (92 kW) at 7,750 rpm and develops its peak torque of 92 lb-ft (125 Nm) at 6,500 rpm. Compared to the engines on the GS, GS Adventure and RT, torque has actually been increased slightly at low revs. The exhaust gases are routed through a 2-in-1 exhaust system with a rear silencer that is steeply angled for dynamic effect. A modified airbox, newly shaped air intake snorkels and a centrally positioned radiator all lend themselves to a slender, sporty and dynamic-looking front silhouette. ABS, ASC and two riding modes as standard. Ride Modes Pro with Dynamic Traction Control (DTC) as an optional extra. For optimum adaptation to individual rider preferences, the new R 1200 RS already comes equipped as standard with the two riding modes “Rain” and “Road”. In addition to ABS, the standard specification also includes Automatic Stability Control (ASC) for increased handling safety when accelerating. And, with the optional Ride Modes Pro feature, the new R 1200 RS also adds Dynamic Traction Control (DTC) with banking detection as well as two extra riding modes – “Dynamic” and “User” – to its technical repertoire. Tubular steel bridge frame with engine as a self-supporting element. Wheel suspension using upside-down telescopic fork and EVO Paralever. A new tubular steel bridge frame, incorporating the flat-twin engine as a self-supporting element, was developed exclusively for the new R 1200 RS. With an upside-down telescopic fork at the front and EVO Paralever at the rear, the wheel suspension adopts the classic chassis technology of dynamic sports tourers, but updated in typical BMW Motorrad fashion. Excellent steering precision, directional accuracy, neutral handling and braking rigidity were all a top priority when configuring the chassis. All while never losing sight of the overriding objective of creating an exceptionally dynamic RS model, whose design DNA is derived from the S 1000 RR superbike. Latest-generation Dynamic ESA (Electronic Suspension Adjustment) option for ideal riding dynamics in any situation. The latest generation of the electronically controlled suspension Dynamic ESA (Electronic Suspension Adjustment) takes the dynamic riding experience to even greater heights. With its two damping settings, “Road” and “Dynamic”, Dynamic ESA enables the rider to enjoy unprecedented levels of handling safety, performance and comfort, as the damping is automatically adapted to the prevailing riding conditions and rider manoeuvres. Multifunctional instrument cluster with analogue speedometer, on-board computer and a wealth of information. The instrumentation of the new R 1200 RS takes a quantum leap into a new sports touring era. The speed is displayed in traditional fashion by an analogue speedometer, but there is also a TFT display for showing a wide array of information. Sporty design with dynamic proportions. Two color and finish styles, each with their own character. The BMW Motorrad RS models have always enjoyed a reputation for being the perfect all-arounders. The new BMW R 1200 RS fuses these credentials with both sharp performance and a sporty, dynamic design. The aerodynamically styled semi-fairing with twin headlights forms the “face” of the new BMW R 1200 RS and makes the fusion of tourer and sports machine plain to see. The dynamic proportions, with the low-set front and the delicately styled tail jutting up at the rear, give the bike a slight wedge shape and leave no doubt as to its sporting prowess and other talents. 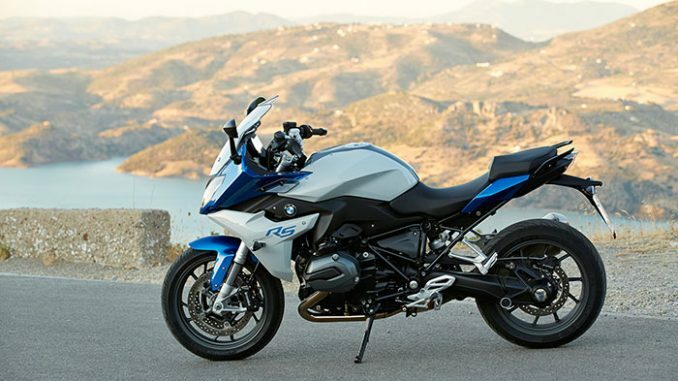 Two color and finish styles each underscore the powerful character of the new R 1200 RS in their own individual way. This results in a choice of two different styles: a classically sporty version in basic colors Lupin blue metallic / Light grey metallic and the sporty and exclusive “Style 2” variation in Granite grey metallic matt. •Classic flat-twin boxer engine with 125 horsepower (92 kW) at 7,750 rpm and 92 lb-ft (125 Nm) at 6,500 rpm. •Sporty and dynamic sports tourer design. •Aerodynamically styled semi-fairing with adjustable windshield. •Classic wheel suspension concept using upside-down telescopic fork at the front and EVO Paralever at the rear. •New intake air duct and central radiator for ultra-compact front silhouette. •Upright, sporty yet relaxed seating position for a dynamic riding sensation combined with excellent seating comfort for longer tours. •Exhaust system in pentagonal design. •Ride Modes Pro offering two additional riding modes, “Dynamic” and “User”, for optimum adaptation to prevailing riding conditions as a factory option. •Dynamic Traction Control (DTC) as part of the Ride Modes Pro option. •Latest-generation Dynamic ESA (Electronic Suspension Adjustment) as an option for optimum riding dynamics in any situation. •Powerful braking system with radial four-piston callipers and ABS. •Gear Shift Assist Pro for fast, clutchless shifting as a factory option. •Sophisticated instrument cluster offering a wide array of functions and wealth of information. •Keyless Ride for supreme ease of use as a factory option. •Innovative color scheme with two individual styles, classically sporty in basic colors and sporty and exclusive in the “Style 2” variant. •Extensive range of optional extras and special accessories available as factory options. BMW motorcycles for travel and sport – the legendary RS family. When BMW Motorrad launched the R 100 RS in 1976, it not only served up an unprecedented blend of sporting prowess and long-distance capability, it essentially founded the industry’s sports tourer segment. The first mass-produced motorcycle in the world to come with a full, frame-mounted fairing developed in a wind tunnel gave rise to the legendary reputation that RS production bikes from BMW Motorrad have enjoyed ever since as the consummate all-around bike for both travel and sport. With the arrival of the new R 1200 RS, BMW Motorrad is continuing this tradition by unveiling a sports tourer powered by a flat-twin engine that succeeds in transposing these original all-around qualities developed almost 40 years ago into modern day amenities. Spirited boxer engine with punchy response from standstill. The flat-twin boxer engine on the new R 1200 RS is the same DOHC drive unit that already powers the R 1200 GS and R 1200 GS Adventure, as well as the R 1200 RT. It produces 125 horsepower (92 kW) at 7,750 rpm and develops its peak torque of 92 lb-ft (125 Nm) at 6,500 rpm. Wonderfully uniform torque delivery, an extremely wide usable rev range and dynamic forward propulsion are among the stand-out qualities of the boxer engine with its two overhead camshafts. Over 74 lb ft (100 Nm) is constantly on tap throughout the usable rev band, resulting in remarkable pulling power and sprinting ability. Due to the modified airbox and new rear silencer, the torque figures at low revs are even slightly higher than on the new R 1200 GS, GS Adventure and RT, resulting in a positive impact on the overall performance of the sports tourer. Like the previous engine generation, the 1,170 cc boxer unit still employs air/liquid cooling, but with a water/glycol solution instead of oil as the cooling agent. The higher heat absorption capacity of water ensures more efficient heat dissipation, resulting in even greater thermal stability. With this system of precision cooling, only the parts of the engine that are particularly exposed to thermal stress are cooled by the coolant. For the most part, the engine continues to be air cooled, too, thereby preserving the characteristic appearance of the boxer drive unit. The flow through the cylinder heads is now vertical for optimum charging, while the six-speed gearbox as well as a light-action oil bath clutch with anti-hopping function and low operating forces are incorporated into the engine housing. The secondary drive runs via the maintenance-free cardan shaft that is positioned on the left-hand side. The particularly sensitive throttle response of the new BMW R 1200 RS is a further indication of the drive system’s high level of refinement. The throttle twist grip’s small operating angle and comfortably low return forces also serve to enhance riding comfort. In terms of sporty and dynamic performance credentials, the combination of the boxer engine and optimum ratio spacing gives the new R 1200 RS tremendous reserves of tractive power for accelerating out of bends, accompanied by a lively, free-revving character. Exhaust system in pentagonal design as well as intake air duct and central radiator for ultra-compact front silhouette. The intake system, radiator and exhaust system have all been designed in line with the specific requirements of a sports tourer. The residual gases are expelled via a dynamic-looking, steeply angled 2-in-1 exhaust system located on the right with a controlled exhaust valve. A redesigned airbox, specially shaped air intake snorkels and a compact, centrally positioned radiator allow the various elements to be packaged together particularly tightly here, resulting in a slender front silhouette. The cooling air is also discharged past the rider’s knee for a comfort-enhancing effect that is particularly noticeable when riding in stop/start traffic on hot days. ASC and two riding modes as standard, plus Ride Modes Pro including Dynamic Traction Control (DTC) as an optional extra for optimum adjustment to operating conditions. For optimum adaptation to individual rider preferences, the new R 1200 RS comes equipped as standard with two riding modes, together with the traction-enhancing Automatic Stability Control (ASC) for increased riding safety. The riding characteristics can be adapted to most road conditions with the help of the two riding modes “Rain” and “Road”. Together with the ABS system – another standard feature – ASC substantially increases the range of use of the new R 1200 RS, while also providing a significant safety boost on slippery surfaces. In “Road” mode, the control systems are set to provide an optimum balance of performance and comfort on all roads. In “Rain” mode, the bike is set up for road conditions offering low grip. Throttle response also becomes gentler with this mode activated. The new R 1200 RS can be equipped with the Ride Modes Pro option that offers two additional riding modes – “Dynamic” and “User”. The Ride Modes Pro feature also includes Dynamic Traction Control (DTC) instead of the standard ASC system. By using a sensor box with banking detection, this particular form of traction control lets the rider accelerate even more safely. The sporty side of the new BMW R 1200 RS can be experienced at its most intense in “Dynamic” mode. Instant throttle response and restrained intervention by the DTC let the bike unleash its full performance potential. 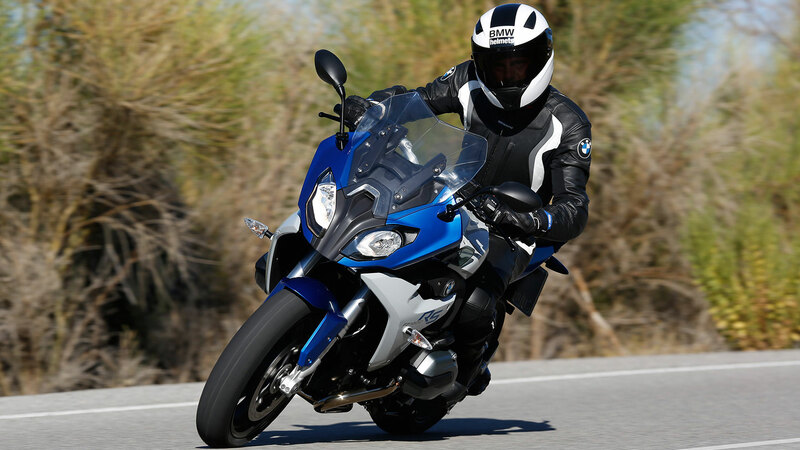 The “User” riding mode, meanwhile, allows riders to configure the R 1200 RS as they please. Besides throttle response, the control characteristics of the Dynamic Traction Control (DTC) can also be programmed to suit personal preferences and requirements in this mode. The DTC modes “Rain”, “Road” or “Dynamic” can be combined at will with the throttle mapping of the “Rain”, “Road” or “Dynamic” modes to produce the desired throttle response. Factory optional Gear Shift Assist Pro for changing gear with virtually no interruption in power flow . Compared to the previous Gear Shift Assistant, the Gear Shift Assist Pro on the new R 1200 RS provides enhanced functionality. It enables upshifts and downshifts to be made without operating the clutch or throttle valve in the riding-relevant load and rev speed ranges, offering the rider greater convenience and an added dose of dynamism. With the exception of starting off, the majority of gear changes can be carried out with the help of the Gear Shift Assistant. When accelerating, the throttle valve no longer needs to be closed for gear changes, allowing the power to flow with barely any interruption. And when decelerating and shifting down a gear (throttle valve closed), double-declutching is used to automatically adjust the engine speed. Gears are engaged in the usual way with the footshift lever. Shift times are considerably faster compared to gear changes with operation of the clutch. The Gear Shift Assistant is not an automatic shift system, however, but merely serves as a rider aid for changing gear. The system works by employing a sensor in the gearbox to detect the rider’s shift request and trigger the assistance mechanism. By increasing or reducing engine torque by the required amount, the load on the powertrain is effectively eliminated sufficiently to allow shifting to the next gear in the same way as when the clutch is used. No gear shift assistance is provided during a gear change when the clutch is depressed, or when shifting up with the throttle valve closed (overrunning) or decelerating. Gear shift assistance is only activated when the shift lever is in its proper starting position when shifting up or down. Comfort plus dynamic performance for travel and sport. The sports tourer is built for the many motorcycle enthusiasts who yearn for a motorcycle offering broad capabilities. Whether it’s travelling long distances at a high average speed, touring with a passenger and luggage on board or darting along winding country roads – any bike in this segment must have all of these modalities in its repertoire. The new R 1200 RS upholds this tradition of serving up a blend of sportiness, comfort and long-distance capabilities, assisted by a completely newly developed chassis. Torsionally rigid tubular steel bridge frame with the engine as a self-supporting element. The chassis of the new BMW R 1200 RS is built around a tubular steel bridge frame incorporating the flat-twin engine as a self-supporting element exclusively developed for the new sports tourer. Large sections of the new model’s frame are deliberately left exposed, underscoring its core qualities such as sportiness and dynamism. The rear frame is also made from tubular steel, with the forged aluminum pegs for the passenger footrests bolted on to it. The rear frame, itself, is bolted to the main frame at four different points and rider footrests are constructed of forged aluminum. The steering head angle measures 62.3o and the wheel castor 114.8 mm. This, together with the balanced 51:49 weight distribution (static, without rider) and a wheelbase of 1,530 mm (60.2 inches), translates into light-footed handling and great riding precision accompanied by maximum stability. Classic wheel suspension featuring upside-down telescopic fork at the front and EVO Paralever at the rear. The new BMW R 1200 RS employs a top-class upside-down telescopic fork with 1.8” (45 mm) stanchions. The BMW Motorrad S 1000 RR superbike served as the inspiration for the design and sizing of the stanchion and immersion tube. One of the reasons for fitting this high-strength telescopic fork was the packaging benefits that have given rise to an even more compact and dynamic look because the radiator could be integrated so neatly. This upside-down fork also provides the basis for excellent braking rigidity and a very direct wheel location for optimum riding precision, along with clear feedback from the front wheel. Spring travel is 140 mm (5.5 inches). Wheel location at the rear is determined by the tried-and-tested EVO Paralever single-sided swingarm. The task of wheel suspension and damping is performed by a central spring strut. The spring preload can be adjusted hydraulically with the greatest of ease using a hand wheel, while the rebound damping can be infinitely varied. Spring travel here is also 140 mm (5.5 inches). The latest generation of the electronically controlled suspension BMW Motorrad Dynamic ESA (Electronic Suspension Adjustment) takes the dynamic riding experience on the new R 1200 RS to even greater heights. Dynamic ESA attains unprecedented levels of riding safety, performance and comfort as the damping is automatically adapted to prevailing riding conditions and rider manoeuvres. Dynamic ESA can easily be recognized by the gold-anodized forks and the spring strut’s white painted spring. With the “Road” damper mapping selected, damper adjustment is fully automated across the entire range and offers maximum comfort and optimum grip on all surfaces. In the “Road” setting, Dynamic ESA provides just the right level of damping at the spring elements regardless of the riding situation or the load being carried. In addition, there is a button that allows the rider to adjust the spring preload to the bike load, independent of the damper setting. Using the information relayed from the spring travel sensor on the rear spring strut to the new sensor box with banking detection, the damping can be adjusted to riding conditions extremely sensitively and precisely. Further variables also help to accurately analyze riding conditions such as acceleration or deceleration, and factor them in when adjusting the damping forces at the rear spring strut and front upside-down telescopic fork of the new R 1200 RS. Adjustment is carried out in a matter of milliseconds by means of electrically actuated control valves. Even in a banked position, this allows the rider to enjoy an unprecedented level of damping comfort and beautifully stable handling characteristics. Dynamic ESA is preset to the “Road” damping set-up in the standard configuration. However, the rider can easily switch to the “Dynamic” damper mapping while on the move by pressing a button on the handlebar, which then activates a firmer damper setting. The handlebar integrated into the handlebar stem, combined with the positioning of the footrests and seat, produces a seating position with a slight front-wheel bias. The result is a wonderfully precise steering feel accompanied by the excellent ergonomic qualities for which BMW Motorrad is renowned. This is ideal for comfortable and relaxed riding, while still allowing the rider to adopt a sportier style without having to suffer any loss of handling precision. The ergonomically advanced seat forms the basis for a perfect bond between rider and machine, and ensures fatigue-free riding pleasure, even on long journeys. Seats which vary in terms of height, design and comfort are available as optional extras or special accessories, allowing plenty of customization opportunities to suit riders’ individual preferences. Powerful braking system with radial four-piston callipers and ABS as standard. Lightweight 10-spoke cast wheels. The new R 1200 RS also comes complete with a suitably powerful braking system to match its high-performance credentials. Featuring ABS as standard, two radial four-piston fixed callipers team up with 320 mm brake discs at the front to provide incredible braking power, aided by the single-disc brake system at the rear with a two-piston floating calliper and a diameter of 276 mm. The 17-inch light-alloy wheels at the front and rear, measuring 3.5 and 5.5 inches in width respectively, take their cue from the S 1000 RR superbike in terms of both styling and lightweight construction. The front wheel is fitted with a “hub cage”, which enables direct mounting of the brake discs without any additional adapters, reducing weight. Tires measure 120/70 ZR 17 at the front and 180/55 ZR 17 at the rear. Distinctive twin headlights with symmetrical light beam apertures. The dynamically styled twin headlights, together with the sporty fairing, don’t just form the “face” of the new R 1200 RS, they highlight the fusion of tourer and sports machine. In addition to offering excellent lighting power and ideal illumination of the road ahead, they also lend the new model a particularly distinctive and unmistakable appearance. A glance at the instrument cluster of the new R 1200 RS reveals how it is propelling boxer-engine sports touring into a whole new dimension. In keeping with the original intended use as an on-road bike, the speed is displayed in traditional fashion by means of an analogue speedometer. This is accompanied by a TFT display serving up a wide array of information. A light sensor is used for automatically adjusting the brightness to ambient light levels and switching between the day and night designs. •In full mode (Style 0), the motorcycle information can be individually arranged or visualized in the two display panels. •The sport mode (Style 1) offers the sporty-minded rider a bar graph for displaying the engine speed. An additional digital rev speed readout is also available. •Riders who wish to reduce the amount of information shown can select the tourist mode (Style 2). In this mode, a digital speed readout is additionally activated, and the information from the onboard computer only appears in the two display panels at the bottom. •Trip 1 and Trip 2. The range of information available can be extended by having the onboard computer Pro fitted as a factory option. Using the menu, it is possible to activate and deactivate the anti-theft alarm system (optional), use the GPS time or the fuel level data if the BMW Motorrad Navigator V (special accessory) is installed, and switch the prompt to perform fuel-saving upshifts on and off. •Average fuel consumption 1 + 2. The new R 1200 RS can also be ordered with the optional BMW Motorrad Keyless Ride System, allowing both the steering lock and fuel tank cap to be released and locked again without the need for a key. As before, the engine is fired up by pressing the start button. With Keyless Ride, riders never need to take the key out of their pocket. A new dimension to travel and sport, courtesy of design. The new BMW R 1200 RS adds new sparkle to the great tradition of sports tourer bikes from BMW Motorrad and paves the way for the future. As a classic representative of the sports tourer segment, it unites the proverbial touring qualities and comfort features of a BMW boxer tourer with the agility and dynamism of a BMW boxer sports machine. It is the perfect choice for dynamic yet comfortable motorcycling. Thanks to its comfortable seating position, improved ergonomics triangle, aerodynamic half-shell fairing and powerful engine, the R 1200 RS handles long-distance journeys, sporty rides along twisting country roads, and steep mountain passes with equal prowess. The new R 1200 RS also packages this wide repertoire within a forward-looking design idiom that boldly conveys its intent. Elongated lines and dynamic proportions. The BMW RS production bikes have always enjoyed a reputation for being the supreme all-around motorcycle for travel and sport. The new BMW R 1200 RS fuses these qualities with a generous portion of dynamic performance and dynamic design. The half fairing’s beautifully balanced proportions, with its low-set front and its light, almost delicate-looking tail jutting up at the rear, give the bike a dynamic, elongated wedge shape and leave no doubt as to the sporting prowess of the new R 1200 RS. At the heart of it all is the classic boxer engine, combined with a single-sided swingarm and cardan shaft drive, encased within the sensational architecture of the latticework bridge frame. The new R 1200 RS – aerodynamic, perfectly toned, authoritative. With its compact, powerful and aerodynamic styling, the proportions of the new R 1200 RS promise an exceedingly agile and dynamic riding experience, together with the superb touring and long-distance qualities that form part of the philosophy of the RS production models from BMW Motorrad. From whatever angle it is viewed, the design clearly signals riding pleasure on country roads or mountain passes as well as supreme expertise when it comes to extended trips or touring holidays – no matter whether riders are travelling alone or with a passenger and luggage. With its short, high tail, muscular tank and low, compact front end, the new BMW R 1200 RS seems to be surging forward even when stationary. What’s more, the upper section of the front fairing has been made to stand out visually, producing an even more athletic appearance. Careful use has been made of black sections to set off the athletically styled fairing, while making the flanks appear slimmer and lighter. Gaps and precisely designed openings blend together with the aerodynamically sophisticated half fairing to give the new R 1200 RS a light and very manageable feel, without compromising its long-distance abilities. The surfaces of the half fairing have been artfully sculpted down to the finest detail, with every line seemingly pressing forward in the direction of travel. Painstaking attention to detail is also evident in the wind-deflecting winglets designed to divert the airflow around the rider’s kidney area. The contrasting color of the fairing’s top section, meanwhile, emphasises the lightness and agility of the new R 1200 RS. All the RS trademarks – dynamic, oozing character, ideal for touring. Together with the aerodynamically contoured half fairing, the dynamically styled twin headlights form the “face” of the new BMW R 1200 RS and clearly reflect the fusion of tourer and sports machine. The headlight apertures are shaped symmetrically, as in the BMW Motorrad touring segment, but the reflectors are asymmetric in form, similar to the brand’s sports motorcycles. The new R 1200 RS clearly spells power, dynamism and comfort when viewed from the rear, too. Two C-shaped bands incorporated into the slim tail end form the rear light, while the distinctively styled pentagonal silencer symbolizes electrifying responsiveness, at the same time as allowing the bike to be banked sharply in sporty fashion and giving a clear view of the rear wheel. Trademark RS synthesis of emotion, design and traditional BMW Motorrad functionality. The BMW Motorrad engineers called upon their experience and creativity to take sporty, dynamic styling and merge it with comfort and long-distance capability, to create an overall concept that both stirs the emotions and delivers eager performance. The delicately styled passenger grab handles and a separate license plate holder may give the tail section a decidedly light feel, but riders may still attach both luggage cases and a topcase. An optional luggage rack also enhances the touring capabilities of the BMW R 1200 RS. Apart from the mounting facility for a topcase, passengers have even more comfortable grab handles that are precision-made cast aluminum elements of the design. A windshield with an innovative four-joint mechanism that can be adjusted to two settings and fitted in a high or low basic position ensures minimal turbulence as well as remarkable long-distance comfort even when travelling at high speeds. The lightweight 10-spoke wheels modelled after the S 1000 RR superbike, the neatly integrated fuel tank with optimally designed knee dent, and the sporty-looking yet comfortable passenger seat are just a few more examples of the trademark RS synthesis of dynamic design language and hallmark BMW Motorrad functionality. Authentic, premium materials and meticulous attention to detail. The philosophy at the core of all BMW Motorrad sports tourer bikes is deftly applied when it comes to the choice of materials on the new R 1200 RS. The footrests for the rider and passenger are made from drop forged aluminum of exceptional quality. The two handlebar halves that are manufactured from forged aluminum and held in place by the intricately designed yoke blend solidness and sportiness. In the “Style 2” variation, the middle section of the fuel tank cover boasts a stainless steel finish, lending the R 1200 RS an added touch of exclusivity. Two color and finish styles for equally powerful yet distinctive sports touring personalities. 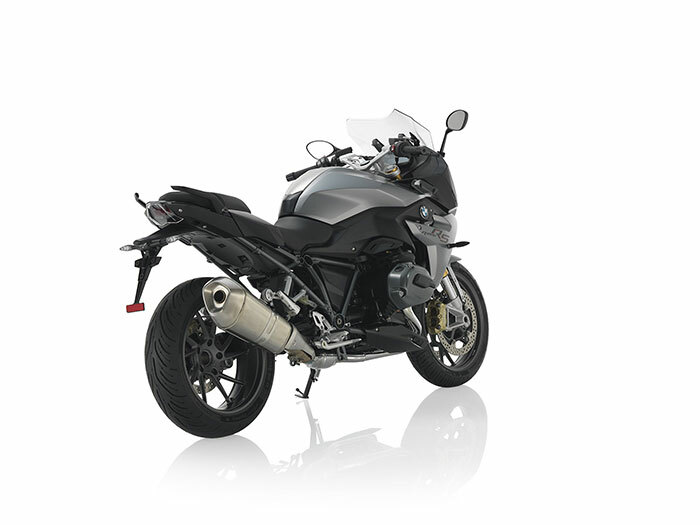 The new R 1200 RS is available in two different styles: the basic colors and the “Style 2” variation. 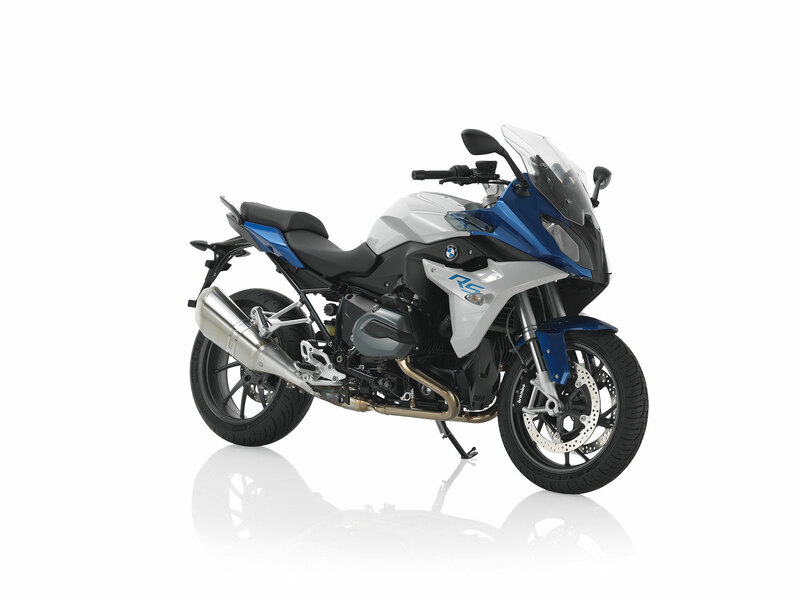 The two sides of the new R 1200 RS – sportiness and touring capability – are highlighted by a color scheme featuring two different color compositions: Lupin blue metallic / Light grey metallic in the basic style and Granite grey metallic matt / Black storm metallic in the “Style 2” variation. In the basic colors Lupin blue metallic / Light grey metallic, the new R 1200 RS is finished in a classically sporty color scheme consisting of a white tone and a powerful shade of blue. This combination has symbolized BMW Motorrad sportiness for many years, and brings the dynamic qualities of the new R 1200 RS to the fore. The sporty model graphic in Lupin blue metallic emblazoned on the light-colored side fairing section in Light grey metallic adds a further dynamic touch and echoes the powerful highlight color of this particular style. •Lupin blue metallic / Light grey metallic. •Plastic center fuel tank cover in contrasting Granite grey metallic matt paint finish. 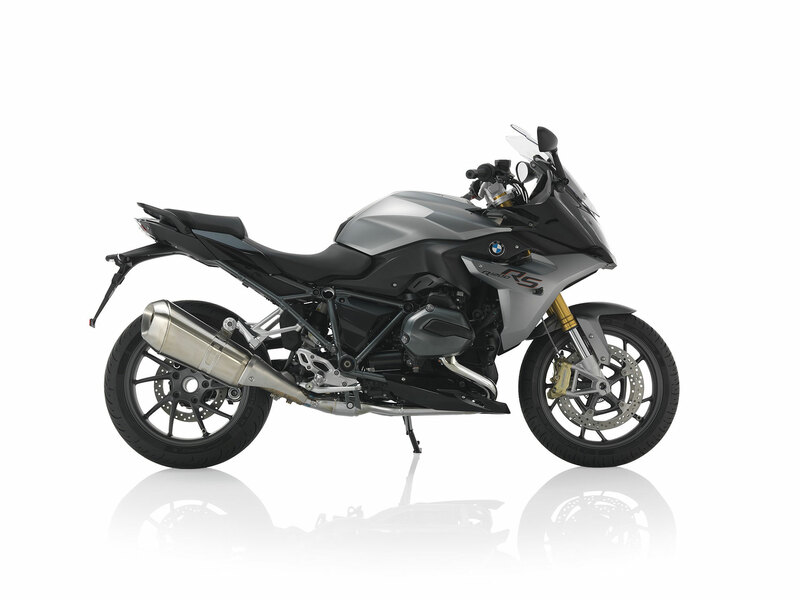 The “Style 2” variation in Granite grey metallic matt with contrasting parts in Black storm metallic lets the sporting genes of the new R 1200 RS shine with exclusive highlights, and conveys its individual character using components and surfaces that have also been specially designed for this style. This color variation is aimed at the sports-minded touring rider. The engine spoiler, gold brake callipers and stainless steel center fuel tank cover contrast with the sophisticated dark-toned main color and make this sporty and exclusive style a real head-turner. The only difference between the model graphic on the “Style 2” variation and the graphic on the basic style is the color: finished in black, it produces a slightly more understated effect, but the use of orange in the lettering injects the new R 1200 RS with an extra touch of sporty flair. •Paintwork in Granite grey metallic matt / Black storm metallic. •Frame color Agate grey metallic. •Engine spoiler in bike color. •Center fuel tank cover in stainless steel. A comprehensive range of optional equipment and special accessories is available for further customization of the new BMW R 1200 RS. Optional equipment items are factory-fitted and integrated in the production process. Special accessories can be fitted by BMW Motorrad dealers or customers themselves, which means the motorcycle can also be retrofitted with equipment. All optional equipment included in the packages can also be ordered individually, with the exception of the onboard computer Pro. •Comfort Package: chrome exhaust system, heated grips, Tire Pressure Monitor. •Touring Package: Dynamic Electronic Suspension Adjustment (ESA) with gold forks, GPS Preparation, onboard computer Pro, saddle bag mounts, center stand, luggage rack with hand grips, cruise control. •Premium Package: Keyless Ride, Headlight Pro, Gear Shift Assist Pro, Comfort Package, Touring Package. •Ride Modes ProSport seat ( 33 inches). • Low seat (29.9 inches). •HP milled rider footrest system. •HP Sports silencer by Akrapovic. •Sport rider’s seat (33 inches). •Low rider’s seat (31.1 inches). •Extra-low rider’s seat (29.9 inches). •Repair kit for tubeless tires.